After you send your email marketing campaign, you may want to share it with others. With our Social Share feature, you can share a sent campaign with Facebook or Twitter followers. In this article, you'll learn how to use the Social Share feature. You don't need to set up one of our social media integrations to use the Social Share feature. The Social Share feature is limited to regular and plain-text email campaigns only. We recommend that you enable Social Cards before you send your campaign. Social Cards allow you to customize the image and message in your Social Share posts. To learn more, read Enable and Customize Social Cards. To use the Social Share feature, follow these steps. 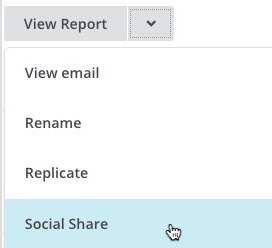 Click the drop-down menu for the sent email campaign you want to work with, and choose Social Share. On the Share Your Campaign page, choose from the social share options. If you're not logged in to the social media option you choose, you'll be asked to log in. Here are the share options you can choose from. This is the campaign URL that links to your sent campaign page. Copy the link and share it anywhere online. We'll post the subject line and campaign URL by default. You can edit the message, but don't remove the URL. If you enabled custom Social Cards before you sent the campaign, your tweet will include your custom image and description. If you enabled custom Social Cards before you sent the campaign, your post will include your custom image and description. Otherwise, we'll automatically select an image from your content. Before your campaign is posted, you'll have the option to edit the headline.